A show pig supplement nutritionally formulated to maintain that show ring look while being used to manage the ideal weight. This supplement is a highly palatable all natural forage, oats, rolled barley, and soy hulls. The berry flavor enhances feed intake and water consumption. 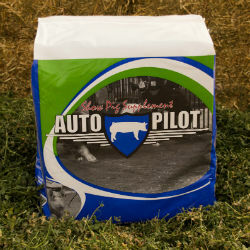 Auto Pilot™ aids in developing rib shape and overall dimension, supports disposition, and aids in lowering stress by satisfying the animal’s appetite while in a holding pattern. It assists in minimizing daily gains while maintaining show ring appearance. The added essential oils help lower body temperature during times of heat stress. When incorporating Auto Pilot™ into your feeding program, it is important to transition over a 1 to 3 day period. Auto Pilot™ can be fed up to 1/2 of the daily diet or can be fed as the sole ration depending on rib fill, dimension and desired weight. If wet feeding is desired water may be added to moisten Auto Pilot™ before each feeding. 1-2 lbs. when supplementing as part of daily diet for added rib and dimension or for weight management. 3-5 lbs. when fed as a total daily diet for weight management, along with added rib and dimension. Feed 1-2 lbs. daily 2 weeks prior and 2 weeks after farrowing for aiding in constipation and enhancing appetites.